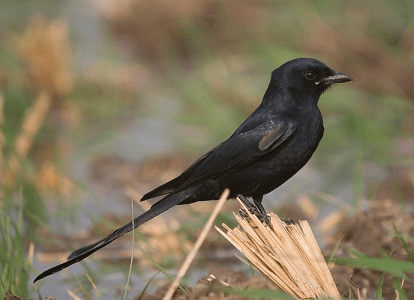 Black Drongo (Dicrurus macrocercus) complete detail – updated. Description of Black Drongo (Dicrurus macrocercus). Habit and habitat of Black Drongo. 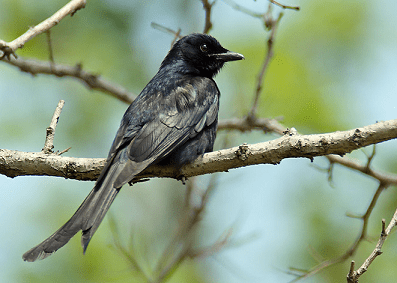 Local name of Black Drongo (Dicrurus macrocercus) is Bhujanga. Classification of Black Drongo (Dicrurus macrocercus). Habit and Habitat of Black Drongo (Dicrurus macrocercus). Generally found in open areas, savanna’s and countries. It lives in open forests, habitation, farmlands and slightly wooded habitats, near water. It may be found from sea level to 1900 meters of elevation. 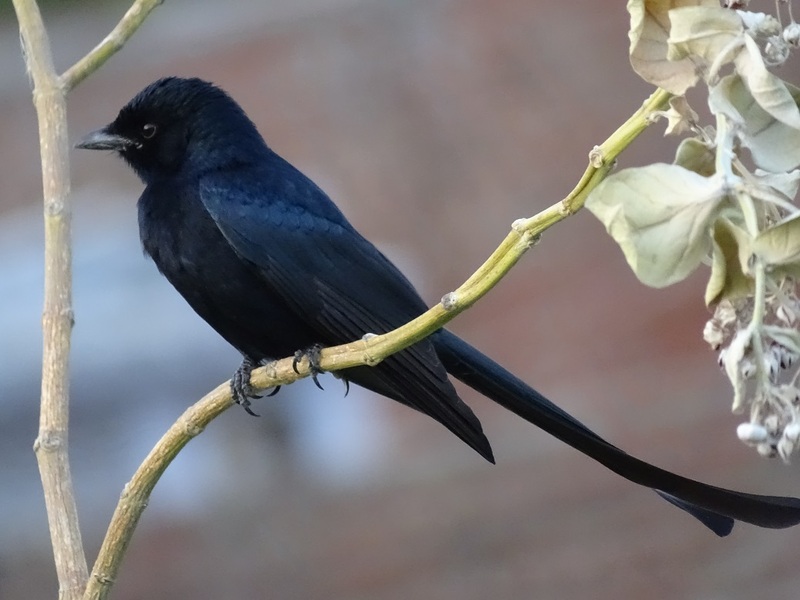 Black drongo is a beautiful Indian bird. It is a wholly black bird with a distinctive forked tail. They are aggressive and fearless in nature. Adults usually have a small white spot at the base of the gape and the iris is dark brown in color. The tail is long and deeply forked, and curves out at the end of outer tail feathers. Head is black, with only very small white patch at bill’s commissures. Bill is black. Eyes are reddish. Legs and feet are dark grey………….. Males and females sing in the mornings during the breeding season. The cup nest is similar to that of the black drongo but is usually made up of more twigs and is well lined with grass. The average clutch consists of two to four white, pinkish or creamy eggs, spotted with reddish- brown. Incubation lasts about two weeks. Both parents share domestic duties and protect the nest. The eggs are incubated by both parents and hatch after 14 to 15 days. 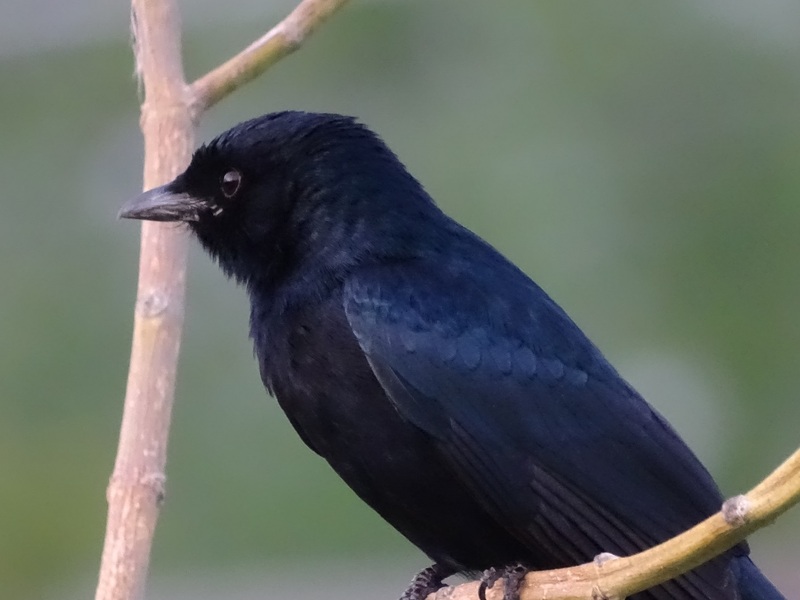 Nestlings are brooded for the first five days, after which the young are capable of maintaining a fairly constant body temperature…………..
Black drongo is a beautiful Indian bird. It is a wholly black bird with a distinctive forked tail. Size of black drongo is between 22 cm to 30 cm including the tail. The Weight of adult is between 40 g. to 80 g.
Black drongo has glossy blue-black or green-black plumage, with semi-translucent primaries visible in flight. Adults usually have a small white spot at the base of the gape and the iris is dark brown in color. The tail is long and deeply forked, and curves out at the end of outer tail feathers. Head is black, with only very small white patch at bill’s commissures. Bill is black. Eyes are reddish. Legs and feet are dark grey. The species is described as generally common throughout the Indian Subcontinent, although uncommon in Bhutan, china, Taiwan. Commonly found in India, Nepal, Bangladesh and Sri Lanka. 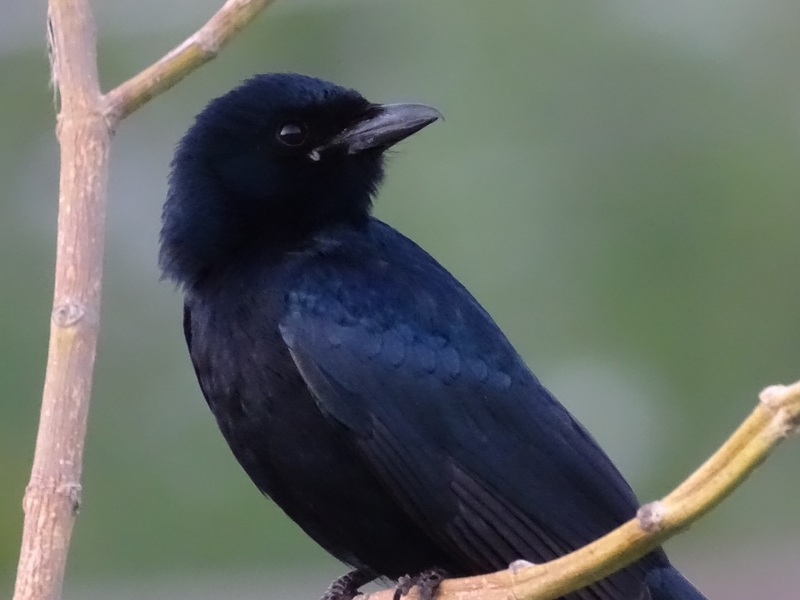 Black Drongo is resident in southern Asia, through India and Sri Lanka, east to southern China and Indonesia. This species is usually found in dry scrub or open forests. The distribution is restricted to peninsular India south of the Himalayas and to the west of the Gangetic delta bounded on the west by the Aravallis. Diet is mainly insectivorous, but it may invariably be seen probing into the blossoms of the Silk Cotton, Flame of the Forest and Coral trees for the sugary nectar they exude. Feeds mainly on insects such as ants and termites, locusts and crickets, beetles, bees, moths and butterflies. It also consumes small reptiles, birds and bats. 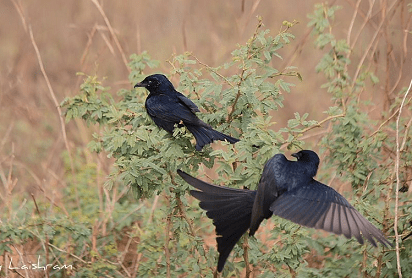 Black Drongo feeds on flower nectar too, playing an important role in plant pollination. They perch upright close to the tops of trees and capture insects in the air with short aerobatic sallies. Larger insects may be captured using their claws. They are aggressive and fearless in nature. Birds are often seen singly or in groups of 2 or 3 individuals. Males and females sing in the mornings during the breeding season. Nest is usually built in a horizontal fork, at tip of a branch in an isolated tree. The cup nest is typically situated in a tree. The breeding season is from February to July. The cup nest is similar to that of the black drongo but is usually made up of more twigs and is well lined with grass. The average clutch consists of two to four white, pinkish or creamy eggs, spotted with reddish- brown. Incubation lasts about two weeks. Both parents share domestic duties and protect the nest. The eggs are incubated by both parents and hatch after 14 to 15 days. Nestlings are brooded for the first five days, after which the young are capable of maintaining a fairly constant body temperature. Young birds have a yellowish-red gape. The feather follicles appear on the fourth day and pin feathers emerge after a week. Nestlings increase in weight steadily until they are 12 days old. The eyes open on the eighth day, the iris reddish-black while the gape turns red. The parents continue to feed and protect them for a month. Young birds may beg for food for longer, but are often ignored or chased away by the adults. Birds reach breeding condition in about two years.